I can remember a time not too long ago when individuals were running amok exploiting the simplest of html tags and creating works of beauty. But now, after browser vendors have stepped it up and given us much of the control we've been asking for, I can't seem to find web designers that are exploiting these new found powers. March 2017 March 2017 March 2017 March 2017 March 2017 Soooooon! Avoid pre-empting the need for markup as styling hooks. auto as flex-basis Box one, two and three are nested inside flex-example. There is another element nested inside box three. Half-border Box Creating the half-border box as a standalone pattern. Fancy Header We need to add some mark-up to identify the parts of the h1 text we want to style. Design for the extreme edges of the experience. The middle is constantly changing. CSS has backwards compatibility built in. Using Feature Queries ▸ Write CSS for browsers without support ▸ Override those properties inside the feature queries ▸ See https://hacks.mozilla.org/2016/08/using-feature-queries-in-css/ ▸ A component based approach helps to keep this all in check! If using display: grid or display: flex ▸ Floated items that become grid or flex items lose their float behaviour ▸ vertical-align has no effect on a grid item ▸ Items set to display: inline-block or display: block become grid items ▸ Your overrides mostly will be concerned with changing widths, margins and padding. ▸ If grid tracks or flex-basis seem to be using a size you didn’t expect, check your item widths! Media Object Moving the title below the image in the source. What happened to vendor prefixes? For older browsers ▸ Check caniuse.com to see where you still need prefixes ▸ Autoprefixer uses the Can I Use database to add these automatically ▸ Autoprefixer will prefix very simple grids with the -ms version. In simple cases this may work for you. ▸ Autoprefixer may also make a terrible mess if you have used properties not part of the IE implementation. Be sure to test! Your component is already a reduced test case. Design that enhances itself as the platform it lives on improves. 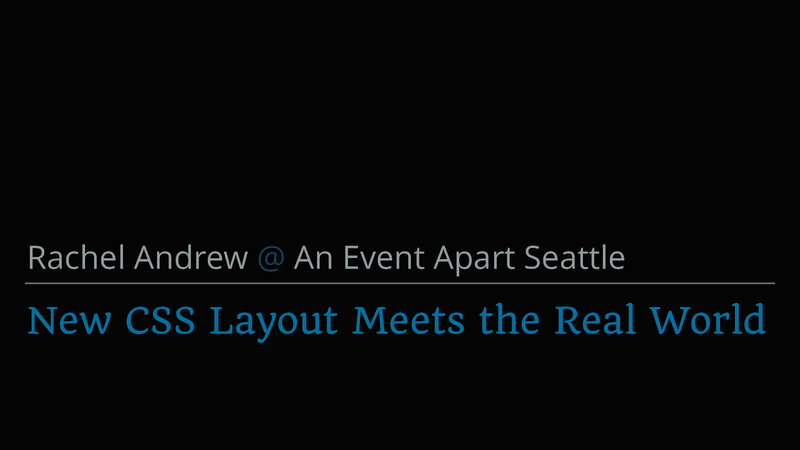 View New CSS Layout Meets the Real World on Notist.